Butter to roast cashews and raisins. I have made some changes to the main recipe. --> Cook pasta according to instructions on the pack, strain away water and let cold water run through cooked pasta for couple of minutes and set it aside. --> In a deep bowl, on a medium flame, add some butter and roast grated carrot until it makes crisp sound while stirring. --> Add milk and bring it to boil; Add cooked pasta; Add condensed milk, keep stirring and let the kheer cook for couple of more minutes. --> Meanwhile, in a separate pan, roast cashews/raisins in 2 tbsp of butter. --> Add these roasted cashews/raisins to kheer and switch off the flame. 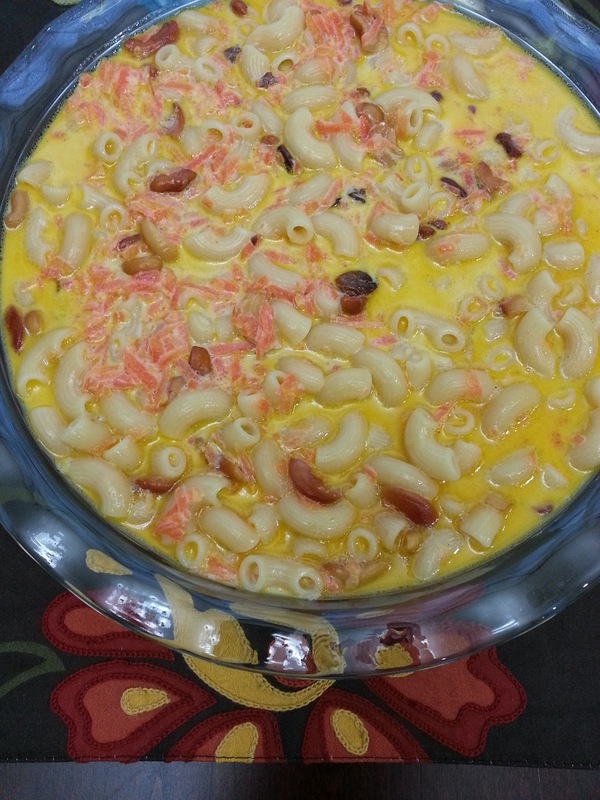 Yummy yummy pasta carrot kheer is ready to serve. An Indo-Chinese dish that suits Indian taste. Process involves 2 parts : including part 1 as deep frying cauliflower florets dipped in flour batter while the second part is preparing gravy. Manchuria can be prepared either as dry or with gravy. I have prepared it as semi gravy manchurian so that it can be served either as starter or with rotis. Wash and separate all the cauliflower florets. 1. Mix rice flour, all-purpose flour, corn startch, salt to taste, red chilli powder, ginger garlic paste, 1 tsp corriander powder with water and make it as medium-to-thin paste. 2. Take oil to deep fry in a pan, dip each cauliflower floret into batter and place each dipped floret into oil. let it fry until golden brown and keep them aside. 3. Repeat the process, until all the florets are deep fried and keep them aside. 4. Chop onion, ¼ tsp of ginger garlic paste, green chillies, bell peppers and saute them. 5. Add 1 tsp corriander powder, salt to taste, cilantro to above mixture and switch off the flame. 6. Now, add hot & sweet sauce and tomato chilli sauce, mix all the manchurian together. 7. Now, slowly add all the deep fried cauliflower florets to the bell pepper gravy and stir altogether until well mixed. 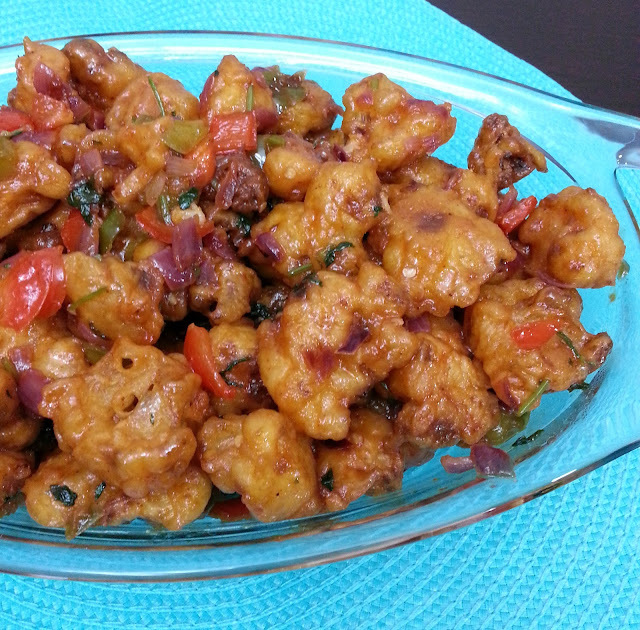 Thats it, yummy yummy gobi manchurian ready to eat. This can be served either as snack/appetizer or can be served with rotis.